Paul Stolis, age 84 of Canton passed away on Wednesday, February 6, 2019. 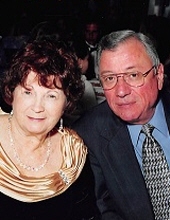 Paul is the beloved husband for 53 years to the late Betty Lou Stolis who passed away December 18, 2017; loving and devoted father of two children, Kevin Stolis and Rebecca (Robert) Moore; proud grandfather of Andrew Moore, Jordan (Megan)Moore and Carynn Moore and great-grandfather of Connor and Kalin. He is deeply loved and will be greatly missed by his siblings, Samuel (Sandy) Stolis and James (Barbara) Stolis. Preceded in death by his parents Lambi & Nikki Stolis , brother Alex Stolis and great granddaughter Austynn Jane Moore. Paul loved his cottage on Secord Lake in Gladwin, Michigan. He enjoyed his summer activities with his family and appreciated the serenity that life on the lake offers. He looked forward to Michigan summers in the sun and enjoying the peacefulness you feel at the lake. Paul also loved to dance – he especially loved line dancing. Dance helps us to express ourselves, and Paul was not afraid to take that first step and show others that he was having fun and enjoying life. Friends may visit the Schrader-Howell Funeral Home, 280 South Main Street, Plymouth, on Sunday, February 10th from 3:00 P.M. to 9:00 P.M. A Funeral Service will be held at the Funeral Home on Monday, February 11th at 11:00 A.M. Paul will be laid to rest at Great Lakes National Cemetery in Holly, Michigan on Wednesday, February 13th at 11:00 A.M.
Memorial contributions may be made in memory of Paul Stolis to the American Stroke Association, 7272 Greenville Avenue, Dallas, TX 75231. Donation envelopes will be available at the Funeral Home. "Email Address" would like to share the life celebration of Paul Stolis. Click on the "link" to go to share a favorite memory or leave a condolence message for the family.